Rolwaling Valley got its name after the popular mountain Rolwaling. The valley borders with Khumbu region to the East, Helambu to the West and dry Tibetan Plateau to the North of Nepal. We take a drive from Kathmandu to Barabise to start this trek. Local Sherpa people named this deep valley as ‘Rolwaling’ which means ‘the Grave’. 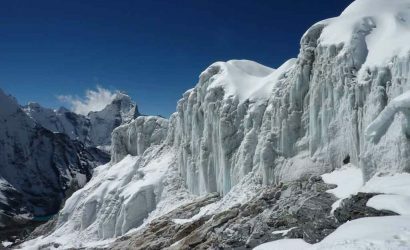 It is because of its location deep down between the steep ice-giants of the Khumbu region. 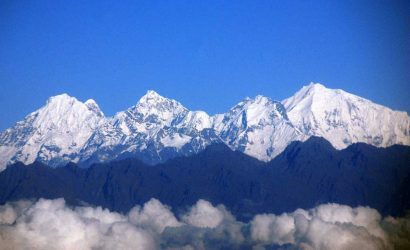 It is a remote and quiet trek which is not often visited by trekkers due to its level of difficulty. Therefore, Rolwaling Valley trek is one of the challenging treks and the high passes make this trek off-the-beaten. The isolated and lonely Rolwaling Valley has a faith to be the home of the infamous Yeti. 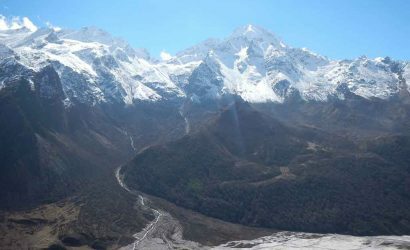 Rolwaling Valley trek offers wonderful views of Gaurishankar, Rolwaling Himal, Chobabhamre, Dorje Lakpa and Pharchamo Peak. Above all, there is a wealth of flora and fauna with over 250 species of birds and animals. This includes the different type of orchids and Himalayan black bear. The trek offers a range of Sherpa culture and lifestyle in Na and Beding settlements. There are some signs of Tibetan influence due to the close border with Tibet. People are mainly Buddhists in the Rolwaling area. Ancient monasteries and colourful festivals are major highlights of this trek. Rolwaling Valley is lush green with Junipers and pines at higher elevations. Finally, the trek ends at Charikot and we drive back to Kathmandu. Rolwaling Valley trek is further extended to Khumbu region across the Tashi Lapcha Pass (5,755m/18,882ft). 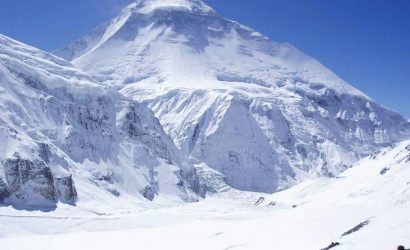 It is one of the most exciting and challenging high mountain routes in Nepal. The trek has some very steep slopes and the trekkers need some alpine experience also. This is a combination trekking of Rolwaling Valley and Khumbu region of Nepal. The trip leads on to the Tashi Lapcha Pass. It goes through the Lake Tsho Rolpa and enters the Khumbu Valley at Thame. We have options here to trek to the famous Everest Base Camp or finish the trek at Lukla. A short scenic flight to Kathmandu is available from Lukla. Drive from Kathmandu to Barabise (1,080m/3,543ft). Trek Barabise to Kabre (1,605m/5,266ft). Trek Kabre to Dolangsa (2,510m/8,235ft). 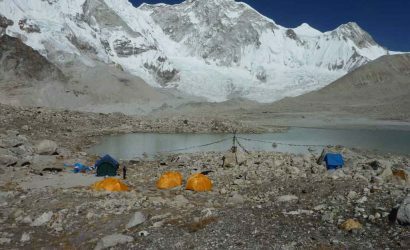 Trek Dolangsa to Tinsang la pass (3,319m/10,889ft) and Camp. Trek Chilankha to Bulung (1,890m/6,201ft). Trek Bulung to Shalu (1,500m/4,921ft). Trek Shalu to Simigaon (1,990m/6,529ft). Trek Simigaon to Sakpa (2,660m/8,727ft). Trek Sakpa to Nyamare (2,900m/9,514ft). Trek Nyamare to Beding (3,690m/12,106ft). Trek Beding to Na gaon (4,180m/13,714ft). Rest day at Na gaon for excursion. Trek Na gaon to Nyamare (2,900m/9,514ft). Trek Nyamare to Sakpa (2,660m/8,727ft). Trek Sakpa to Chet Chet (1,390m/4,560ft). Trek Chet Chet to Thare (1,980m/6,496ft). Trek Thare to Bulung (1,890m/6,201ft). Trek Bulung to Singati (950m/3,116ft). Trek Singati to Dolakha (1,660m/5,446ft). Drive from Dolakha to Kathmandu.